In September, Volvo Trucks North America (VTNA) announced it would supply electric trucks to a demonstration project in California in 2019. Yesterday, the company provided a few more details on the project, including the vehicle that would be involved: Its VNR regional tractor model. In a roundtable discussion with North American media at the House of Sweden at the Swedish Embassy in Washington, DC, on Tuesday, new VTNA President Peter Voorhoeve said the demonstration tractors – there will be 23 in all – will tap into the immediate success the VNR has garnered in its short time in production. That vehicle and its long-haul companion the VNL, have seen more than 63,000 orders since their introduction in mid-2017, Voorhoeve noted. Volvo Trucks, which also just received a new president today as Roger Alm will take over the post as of Jan. 1, 2019, succeeding the retiring Claes Nilsson, is already testing electric tractors with its Volvo FE and FL models in Europe. Those vehicles are expected to be commercialized there next year. “We believe the VNR is the electric truck for North America,” Voorhoeve said. Few details of the VNR model, such as range or payload capacity, were released, other than the electric powertrain will be from Volvo and will build upon the powertrain developed for the FE and FL models. The FE Electric is designed for up to 27 tons with a 125-mile range on a single charge. It has two motors that come with maximum power of 370 kW, with a Volvo two-speed transmission. The energy storage is through lithium-ion batteries, which can hold 200-300 kWh. Charging time is 1.5 hours from empty with a CCS2 150 kW DC charger. It takes 10 hours to charge the truck with a low-power charger producing 22 kW AC power. Voorhoeve and Koeck both noted the advantage of global scale that Volvo enjoys on programs such as this, pointing specifically to the Volvo Group’s long history with electric buses and two projects similar to the California LIGHTS project currently running in Europe. Koeck quickly pointed out, though, that Volvo was not reacting to any threats from others. “We have our own agenda and our own path,” he said, again pointing to the scale of the Volvo Group (OTC: VLVLY). “We shall not underestimate the skill [it takes] to build 200,000 trucks [a year],” he added. “Anyone can build 2 or 10, but to have a supply chain in place to build and service 200,000 trucks” requires expertise and scale that a company like Volvo brings to the table. The diesel-powered VNR was introduced by Volvo as an option for the growing “regional haul” market, which includes urban distribution, drayage and e-commerce linehaul. The LIGHTS (Low Impact Green Heavy Transport Solutions) project seeks to demonstrate the value an electric vehicle can provide in these types of segments. Participating in the LIGHTS project with Volvo is California’s South Coast Air Quality Management District (SCAQMD), California Air Resources Board, and carrier NFI. Sixteen partners in all are involved as the program seeks to develop and “end-to-end” solution for electromobility. A variety of smart technologies will be used – including remote diagnostics, geofencing, and the Volvo’s web-based service management platform – to monitor all truck performance aspects of the project and maximize vehicle uptime. CARB provided $44.8 million for the program, which will cost $90.7 million in all. 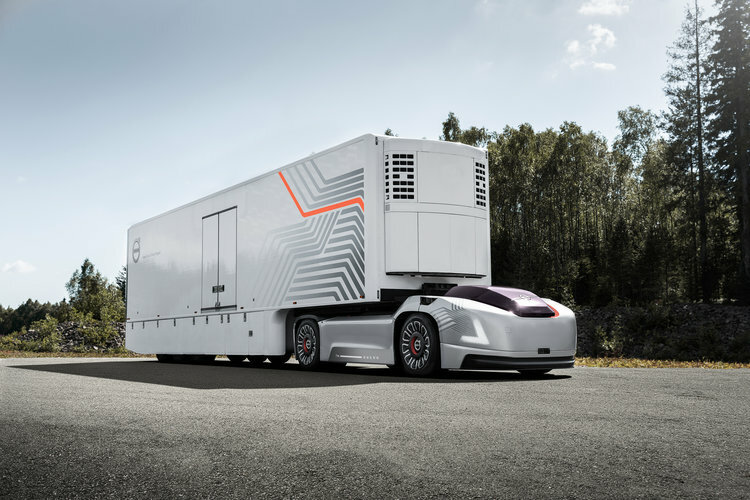 An example of this approach is the Volvo Group’s VERA project, which sought to incorporate not only electric, but also autonomous technologies, into a workable vehicle. The Level 5 transport solution features no cab and no place for a driver to sit. Prior to the announcement of the electric VNR, Voorhoeve walked the media through an update on VTNA’s performance in 2018, and a brief look at 2019. VTNA’s market share continues to climb. In the U.S., Volvo’s market share has risen to 10.6% year-to-date, up from 8.7% last year. That jump is even larger in Canada, where share has grown 3.1% to 13.3% overall. Voorhoeve said Volvo expects total Class 8 orders to settle around 310,000 in 2019, approximately the same as this year. Volvo has already set records in 2018, with Q3 order intake rising 44% (compared to Q3 2017), 17% more new trucks delivered, an increase in spare parts sales of 21% and net sales increase of 25%.